When it comes to trying to conceive, many medical experts believe that diet may play a significant role within the process. By following a fertility diet and proper nutrition one can work to enhance the chance of conception for both men and women. This is especially prevalent with women who suffer from PCOS, Polycystic Ovary Syndrome, as it can help to balance hormones within the body. An issue that many women with PCOS may have is an intolerance or reaction to gluten. Gluten has been found to mimic hormones created within the body. This can cause the body to be confused when processing and breaking down the food and either under or over respond with your own hormones in return. This hormonal imbalance that occurs can make ovulation and conception rather hard. A condition that is closely linked with PCOS is that of insulin resistance. Insulin resistance is the inability of cells to properly process insulin within the body. This is the hormone that helps the body to break down glucose in food and turn it into energy. This imbalance can lead to further health concerns down the road. By focusing on a diet that works to balance blood sugar levels you can help to avoid this from happening. You can do this by staying away from foods that have a high carbohydrate count or that are high in sugar. As they can make the body crash from a rapid change in blood sugar. It is also important to find foods that have a low glycemic index. These foods are mostly whole grain and natural foods that have not been processed or refined. These types of foods will not create a drastic change within the body of blood sugar levels. Instead, they will help to keep your hormones from fluctuating too much, throughout the day. Try to avoid processed foods. Instead you should look for foods with less ingredients or whole foods that are natural. It is best to avoid foods that are not organic and avoid artificial sweeteners. If you chose to eat dairy products it is important to look for organic and hormone free products to help avoid anything that may react within the hormones of the body. Make sure to also look for low-fat dairy options. If you are eating foods rich in carbohydrates, it is important to try and balance them with protein so that you will not have a large blood sugar reaction. Using all of these guidelines and recommendations, can feel like a lot at first. However, once you make the change to a fertility friendly diet than you will notice a difference within your body and hopefully improve your chances of conceiving. During the holiday times, many of us enjoy home baked goodies and treats around a nice fire. We have gathered a few fertility-friendly and PCOS-friendly recipes to help make your holiday season that much better! In a bowl, combine the almond flour, lard, egg, cinnamon and salt together. Mix with a spatula until the batter starts to stick together and start kneading with your hands until a ball forms. Place the dough over a piece of parchment paper and cover with another piece of paper. With a rolling pin, roll out the dough over the paper until it forms a circle that is about 10-11″ for a 9’’ glass pie plate . Peel the top parchment paper and flip the dough onto the 9″ pie plate making sure all sides are covered. Peel the parchment paper and fix any issues you may have with the extra dough that falls on the side. In a large bowl, combine the pumpkin puree, stevia powder, cinnamon, cloves, cardamon, ginger and nutmeg. Mix with a whisk until combined. Pour the coconut cream in and mix again. Add your eggs one at a time while mixing until all of the batter has been incorporated. Pour the batter into the pie plate and place in the oven. Bake for 45 minutes. Take it out of the oven and let completely cool before serving. With a rolling pin, roll into a ½ inch thick disk. Cut into small bricks or cut using biscuit cutters, a knife or a pizza cutter. You should be able to make 40 cookies. Preheat the oven to 300F. Wrap the bottom of a 6” springform pan with aluminum foil. In a small bowl, mix the ingredients for the crust together until it resembles a buttery crumble. Place in your springform pan and press unto the bottom with a spoon. Even it out with the back of the spoon. In a large bowl, place the cream cheese, sour cream, erythritol, stevia powder and vanilla, and beat with a hand mixer until the mixture is completely smooth and creamy. Add the eggs one at a time and mix until incorporated. Do not overmix. Add the baking powder, and mix for a few seconds. Pour the cheesecake batter into the springform pan over the crust. Tap a couple of times on the counter to get rid of any air bubbles (if there were any). Prepare a tall oven-proof tray and add 2-3 (1″) of water. Carefully place your aluminum-wrapped cheesecake into the water and place into the oven. Bake for 60 minutes. Open the oven door and let the cheesecake cool completely inside the oven for 1-2 hours until completely cooled (Your cheesecake should still be wiggly in the middle). Cover with plastic wrap, and place into the fridge overnight. You can decorate it as you wish or eat it plain once it’s completely cooled and set the next day. Put the brown sugar, shortening, and corn syrup in a saucepan and heat on medium, stirring constantly until the shortening is melted. Put all of the dry ingredients in a large bowl; then add the warm sugar mixture, stirring until all of the ingredients are well blended. The dough will appear crumbly but will hold together when rolled out. Use the dough immediately, while it is still warm. If it starts to crumble, place it in a warm oven for 1 to 2 minutes until it softens a bit. *To make decorated cutout cookies; Roll out the dough to about 1/8-inch thick on a lightly floured surface. Cut out gingerbread women and men with cookie cutters. Place the cookies on foil-lined cookie sheets and bake until golden brown, about 10 to 15 minutes. Cool the cookies on racks before decorating. **To decorate, tint a recipe of royal icing to your desired colors. Keep the icing covered with a damp towel while you are working to prevent it from drying out. 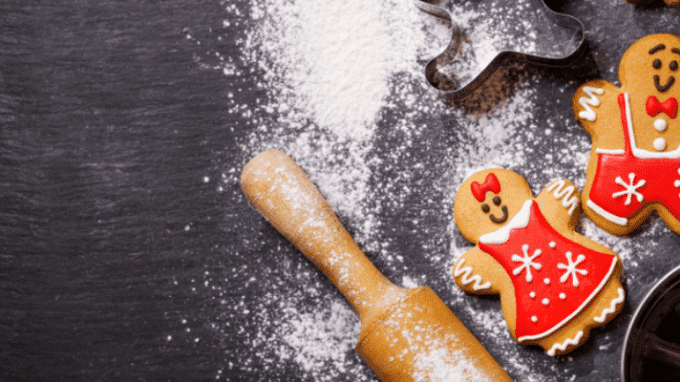 To cover a cookie with icing, thin some of the icing with a little water and spread it on the cookie with a knife or metal spatula. Add dragees, edible glitter, colored sprinkles, or other decorations to the wet icing. To attach candies to un-iced cookies, brush a thin layer of clear piping gel on the cookie with a small paintbrush and add decorations. Pour batter into prepared pan and bake until a toothpick inserted into the center comes out clean, approximately 45-50 minutes. If you feel you need to cook it longer, cover cake with aluminum foil to prevent burning the top and lower the heat to 325°F. Cook until toothpick comes out clean. Simmer on low heat for two hours, stirring occasionally. Do not cover the pan. You will know you cooked it long enough when the coconut milk is reduced to half and has a thicker consistency and darker color, similar to sweetened condensed milk. Mix coconut milk with melted chocolate until all is combined and smooth. Let cool for 5 minutes before icing the cake. 1.Preheat oven to 325 F or according to directions on pie crust. 2.Combine apples through allspice and pour into thawed pie shell. 3.Combine butter through cinnamon and use pastry blender or fork to blend well to a crumble. 4.Sprinkle on top of apples and bake in oven until apples are bubbly and crumble is lightly brown about 70 minutes. 5.Top with a drizzle of caramel sauce if desired.